I was introduced to the air fryer this past summer by a dear friend. She raved about how awesome and easy it was. Immediately, I reached for my phone, pulled up the Amazon app and searched air fryer. A bit overwhelmed I scrolled down the page. I read reviews. Weighed my options but held off on the purchase because we were in the midst of relocating and the last thing I wanted to do was have another piece of kitchen equipment to pack. When we settled into our new home an air fryer was one of the first things I purchased. Product description: Air fried french fries contain up to 70% less fat than deep fried french fries, so if you're looking for a guilt-free (or guilt-reduced) way to enjoy some of your favorite foods, it's time to join the air-frying revolution! The Simple Chef Air Fryer features temperature controls ranging from 180 to 400 degrees Fahrenheit, a 30 minute standby timer, dishwasher safe non-stick basket and pan, rapid hot air circulation, overheat protection, and a satisfaction guarantee. It sells for $59.99. Great price, especially for air fryer newbies such as myself. The instructions guided me at what temperatures to cook chicken, pork chops, potatoes, etc. Through experimenting, I discovered those times and temperatures can be adjusted slightly. It had me at your-whole-chicken-is cooked-in-45-minutes. Not having my oven on during summer in Florida made me a happy woman. The basket inside has holes and disconnects from the pan--where any drippings will go--both are dishwasher safe but I used my daily and hand washed it with soap and a dish scrubber. It's non-stick which made it easy. The rapid hot air crisps chicken, browns pork chops and toasts up grilled cheese. There is a vent in the back. Don't touch it while it's on, it's quite hot. No oil is needed. I know, weird right? I still use a bit of olive oil when I make homemade french fries. The seasonings stick to the potatoes better. My son loves to cook steak and pork chops in it. The steak isn't as brown on the outside like if you grill it but it tastes delicious. I do preheat the air fryer for a couple of minutes. It can comfortably fit two bone-in pork chops, 2-3 chicken breasts, and about 9-12 chicken drumettes. When I make french fries I shake them up every few minutes for even crispiness. The heating element is at the top of the air fryer. My one complaint with this model is after a few uses the latch which locked the pan into place was loose. At times, it would pop open a bit. I know I used it a lot but I thought it would last longer than 2 months. It stopped working one September afternoon. Darn it. I guess I'll have to purchase a bigger one. Product description: Avalon Bay is simply giving you the opportunity to fry, bake, grill or roast your food, but in a healthier way. 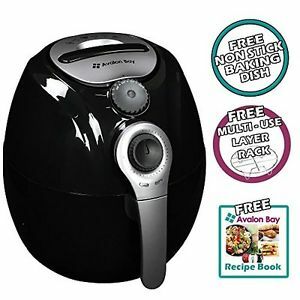 Features: 3.2 liter oil-less air fryer includes 2 piece baking set and cookbook 30 minute timer non-slip feet removable basket for easy transfer of food temperature up to 400 degrees 1400 watts/120 volts. Don’t deep fry your food, air fry your food in this healthy mini convection oven. Air fryers work the same way as convection ovens, but better. I decided on this one due to a number of positive reviews, and I didn't read anything about the latch loosening or the pan popping open. This one sells for $72.99. The added space does make a bit of difference when it comes to larger pieces of meat. Though a small cookbook (pamphlet) did accompany the air fryers, it's basic. I found more recipes and ideas on Pinterest. Quickly I became comfortable using my air fryer and doing my own thing. I love experimenting with food and creating new recipes. One of the main reasons I love my air fryer is not only because it cuts down on cooking time but it has given my quirky teenage son the confidence to cook on his own. Logan has never been comfortable using the oven or stove. He'd do it, but there would be anxiety. With the air fryer, he can season ribs or pork chops, put them in the basket, set the timer and temperature and in less than 30 minutes have lunch. If I'm not home, I don't worry about anything homeowners-insurance- worthy to occur. Logan's face of success when he plates his food warms this mamas soul. Many teenagers don't know how to cook and when they leave the nest they tend to eat a lot of processed foods. I did the same thing when I was 17 and after I was married. I didn't teach myself to cook real food until after I was 30. I believe those processed foods contributed to my digestive and food allergies; I don't want Logan to go through that. Plus, his future wife will thank me when he can whip up a lovely dinner under 45 minutes. This small kitchen appliance has made a huge difference. This review is just a woman and her thoughts. There are many out there. Take your time and do your research. I'm asked all the time "What the heck is an air fryer?" I didn't know what it was either up until 5 months ago. We all lead busy lives, why not make it simpler and healthier? I hope I helped a little bit on your decision to purchase an air fryer. Logan and I are going to post our recipes in the coming weeks, stay tuned for those. We have some good ones. If you have questions, please feel free to ask.